Indecisive? Or perhaps you’re always reaching for the slicer when you really wanted the wedger. Well, well, well, this is the product for you. 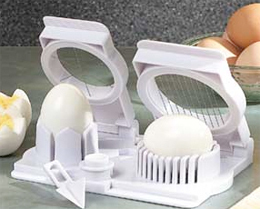 The Egg Slicer & Wedger provides double barreled egg preparation all in one convenient gadget. No matter if you prefer your salads garnished with egg slices or with the clearly superior egg wedge, this all-in-one makes quick work of the hard-boiled incredible edibles. Especially useful for those rare times when only slices and wedges will do.